Gone are the days of generic superhero stories! Now, in 2014, we’ve gotten to a point in time where superheroes aren’t as one dimensional as they used to be and I personally think it’s a great place to be creatively-speaking. Over the past few years the superhero movie craze has exploded with the release of countless “Marvel” and “DC” films to the delight of audiences around the world. Hero stories have evolved to the point where it’s no longer JUST about saving lives while living two of your own, no this genre has grown to be much more than that. The one thing you have to know about the “Zetman” series is that it’s based off of a manga that has been running since 2002 and is ongoing at this point in time. The series is a total of 13 episodes so before even watching this anime it’s obvious that it is going to be somewhat rushed. Unfortunately it doesn’t pay off well for “Zetman” but we’ll get to that soon enough. The series follows the stories of two young boys growing up in a world crawling with dangerous monsters disguised as humans. These monsters (called “players”) were developed long ago to fight in underground arenas for the sake of entertainment. The rich would watch these human-turned-creatures fight to the death. They’d gamble, they’d eat, they’d drink and they’d have a pretty good time doing it too until these “Players” decide that enough is enough and rebel…which is exactly what happened. Cut to many years later and we’re introduced to Jin; a young, homeless boy living with his grandfather Gorou. Little Jin, along with his friend Kouga, would fight crime on the streets of this unnamed city. While Jin would ask for money to save people, Kouga felt that it was immoral and would fight simply for “justice”. One fateful day, Jin’s grandfather is murdered by a cereal killer who’s been causing some serious trouble around town. After certain events transpire, Jin confronts this “person” who turns out to be, yep you guessed it; a “player” disguised as a human. Transforming (“regressing” as they call it in the series), the murderer attacks Jin but this kid isn’t normal, he’s something different, something on a whole other level. Jin kills the “player” with his natural strength and this is where the series truly kicks off. Many years later, Jin is now a teenager and lives with the woman who took care of him after his grandfather died. After coming into contact with another “player”, years after his first kill, Jin transforms into what we soon come to know as “Zetman”. Jin’s life then begins spiraling into obscurity as he finds out more about his past and continues to battle the evil forces know as the “players”. Now I’ll stop there, not only because I’ve already written enough about the story but because to tell you anymore will most likely take away from the twists and turns of the series. “Zetman” is written VERY well though it is majorly rushed so you don’t always get the full picture. I feel as though some storylines are cut short due to the crippling episode limit but, for the most part, you do get a chance to enjoy every small arc as they play out. What I loved the most about “Zetman” was the way the stories of Jin and Kouga intersect with each other: For most of the series we’re shown these two men individually living their own lives and walking separate paths, both of which are leading to the same place but we don’t know that until a little later. The comparison and contrast between the two main characters is brilliant and it’s shown in the series in a way that isn’t too obvious but isn’t too vague, there’s a nice balance to it. The series falls victim to something quite typical of short series’; the first few episodes are great and the last few episodes are brilliant but the ones in between are lackluster and I blame it on the 13 episode restriction. Had they been given more screen time to work with, I guarantee this series would have turned out so much better. 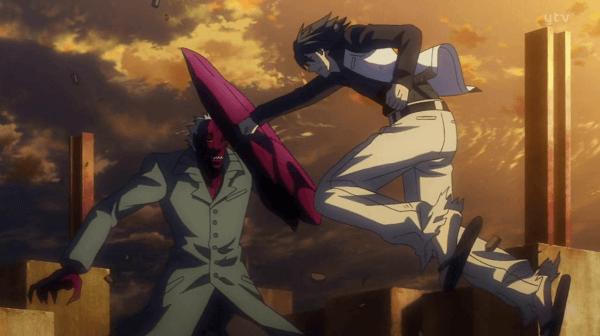 Despite the fact that “Zetman” was only made two years ago, I still found it to be kind of rough around the edges when it comes to the animation quality. Artistically-speaking, the series looked brilliant! It had a gritty and rough style that focused on the use of over-exaggerated facial expressions to convey true emotion to a degree in which I don’t believe I’ve ever seen before, the only unfortunate thing about the series is that it’s animation quality wasn’t the best, as mentioned above. There were times when you saw a definite bump in the quality but those times were few and far between, and often easy to miss. What I found myself reveling in most of the time was how well-designed the characters were. Not just the monstrous “players” but even just the regular human characters had an air of “realness” to them. 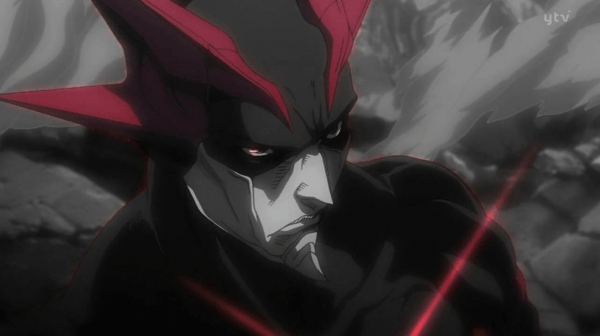 “Zetman” (the series) looked like an artistic fusion of “Tiger & Bunny” and the “Shin Megami Tensei” series. Jin and Kouga definitely shared characteristics with Kotetsu and Barnaby (Tiger & Bunny), and “Zetman” absolutely looked like a demon you’d come across in any “Shin Megami Tensei” title. 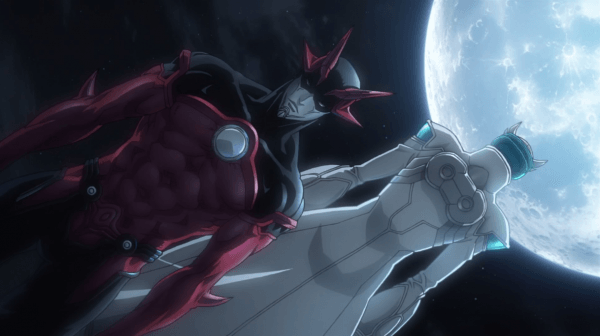 Luckily for me I happen to enjoy both those series’ so i absolutely loved the style of “Zetman”…if only the animation was good enough to do it justice. This is where I believed the anime really fell flat. 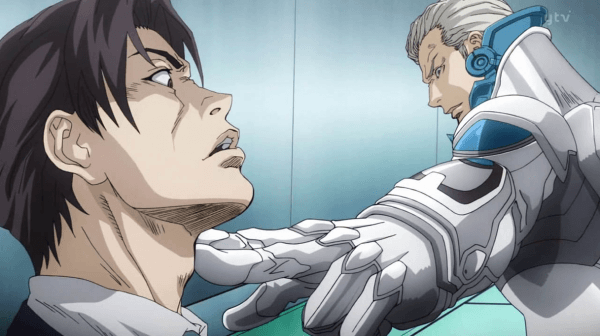 “Madman Entertainment” has given viewers the option to watch the series in both it’s original Japanese form or in it’s English dub form but it seems as though the English cast really lets the series down due to their sub-par acting. It was only near the very end of the series did you truly get a feel for just how talented these actors and actresses really are, most of the series they were forced to recite mediocre dialogue and, honestly, it didn’t seems as though they did the best they could’ve even with what they were given. Characters seemed…bored. Half the time the voice actors couldn’t even scream or show true emotion though there were pockets of the series that showed some of what it was I was looking for. The soundtrack, for me, wasn’t memorable at all. I found the opening theme song to be quite annoying and the closing theme song to be just out of place. I wasn’t impressed at all when it come to the soundtrack, not until the very last scene of the series where it really made an impact on me. Had it made me feel that way throughout the whole thing, then I would’ve been more impressed. 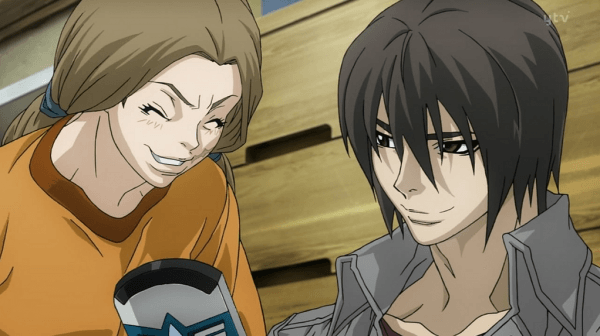 The “Zetman” series collection come with nothing but the bare bones of any anime release: Clean opening and closing sequences, and a series trailer. I was quite disappointing; the series has such a great artistic style so it would have been nice to see some more artwork from the development stage but instead we got nothing. The on thing close to that was the flip side of the cover sleeve which had a nice image of the main cast. I actually really enjoyed this series but that was only because I chose to put a great deal of focus into theorizing and speculating about the story in regards to all the different pieces of information that weren’t provided through. The voice acting and lack of memorable music did put a real dampen on the experience but at least the art style was good enough to keep me around. The animation quality isn’t the best and the story is rushed so, even when it comes to the things I did like about the series, some aspects of them did bum me out a bit. I’m not sure how close to the source material this anime is but I’ll give it the benefit of the doubt and say that fans of the manga will enjoy the anime. I think if you have an open mind about what anime titles you watch and you don’t mind sitting through some cringe-worthy dialogue than this may just be the series for you.